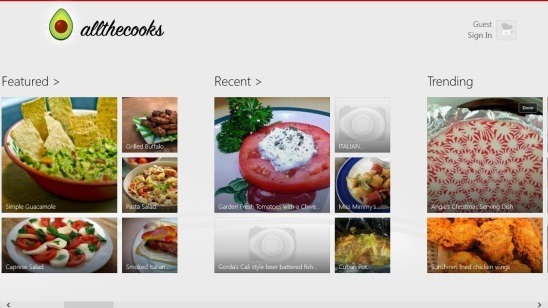 Recipes by allthecooks.com, also known as allthecooks app is a free Windows 8 cookbook app added with features to socialize. That is, using this app you can not only learn to cook new dishes, but you can also connect with other users of allthecooks.com. The website has its own online community and has various cooking forums. Using this app, you can join this community and follow forums. Also you can ask questions about a dish, reply to other users, give a review on a dish, and do much more. 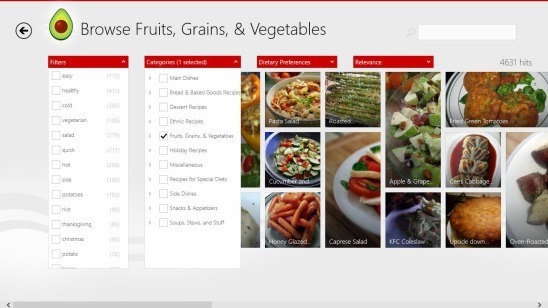 This Windows 8 cookbook app advertises over 150K recipes in its store. So, there is something for everyone. Besides that, this Windows 8 cookbook app is beautifully integrated with Windows 8 Search, Share, and Settings Charms. There are furthermore very good features, which you can use while learning to cook within the app. Some of them includes: Search option, View recently viewed recipes, pinning a recipe to start screen, mark it as favorite, create and manage the shopping list, add your own recipe and then share it with friends and community, etc. 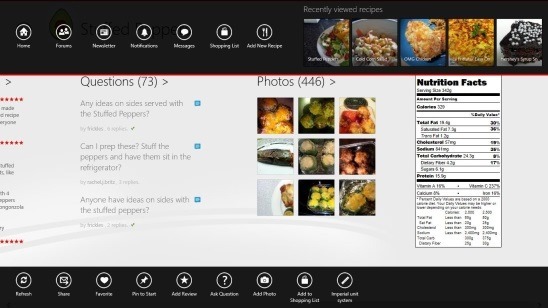 This free Windows 8 cookbook app is present under the Food & Dinning Category in Windows Store. 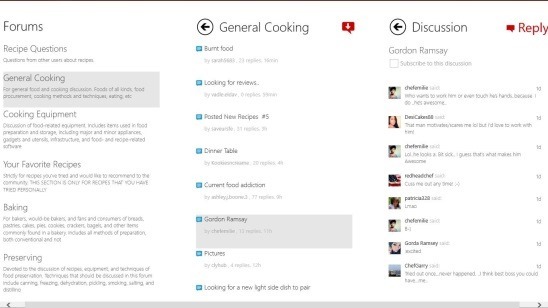 You can use the Windows 8 Search Charm (Win + Q), and then type “Recipes by allthecooks.com” in the search field. Also there’s a link at the end of this article, which you can use to download and install this app. On launching the app, you’ll get the Main Screen (Home) which contains following categories: Favorites, Featured, Recent, Trending, and Browse categories. All of these categories include their respective dishes under them, except the Browse Categories; the browse categories further contains sub categories based on the type of dishes and the occasions on which they are prepared. All the dishes under each category are displayed in big rectangular tiles of different shapes, making the interface look good. There are tons of food categories included within the app; including main dishes, dessert recipes, ethnic recipes, side dishes, snacks & appetizers, soups, stews and stuffs, and many more! You can choose any number of these categories and filter the dishes to your need. Also there’s another filtering option available in the app named Filters. This option is very helpful because it contains very basic and mostly used filters, such as: easy, Christmas, thanksgiving, cold, hot, quick, breakfast, gluten-free, low-fat etc. Simply check on the requisite filters, and the app gets the desired results for you. I liked the fact that the app tries its best to provide you with the healthiest food, even for the people who are on diet. Besides the two above mentioned filtering options, there’s one more filtering feature called Dietary Preferences. Using this feature you can filter the dishes according to your preferred diet. Some of the filters included in this feature are: dairy free, egg free, fish free, vegan, vegetarian, etc. This filter also works the same way as the above mentioned two filters. The app works really fast and switches between screens quickly. Scrolling to left or right within the screen is really smooth. I liked the fact that the app lets you do minimal work in terms of navigating, searching, and browsing, and lets you focus only on cooking stuff. The cooking steps are explained in simple and easy to understand steps along with images. Also the app shows the exact amount of cooking ingredients. Simply click on a meal to view its instructions. The meal screen also contains the reviews and photos of the particular dish. Right clicking on this screen opens two flyouts. These flyouts contain powerful buttons which includes: Home, Forum, Newsletter, Notifications, Messages, Shopping List, Add new Recipe, Refresh, Share, Favorite, Pin to Start, Add review, Ask Question, Add Photo, Add to Shopping List, And Unit System. All of these are pretty self explanatory and easy to use. Simply click on them and you’ll get the related options. Reading forum was quite good experience. You can find many cool stuffs about foods which you don’t know, and also you can join a conversation. But obviously for that you need to log in with your allthecooks credentials. This free Windows 8 cookbook app contains a wide variety of healthy food recipes. With every recipe the app shows the Nutrition facts of the dish. That is you can see the total percentage of Protein, Fats, Cholesterol, Carbohydrates, etc., in a dish. This helps you to stay fit with your diet and avoid eating unhealthy food. Good Windows 8 cookbook app. Step by step instructions with photos. Search, share, pin, and add a dish to favorite. Ask question and add review with stars to a meal. Follow the community cooking related forum. Create and manage a shopping list of ingredients. 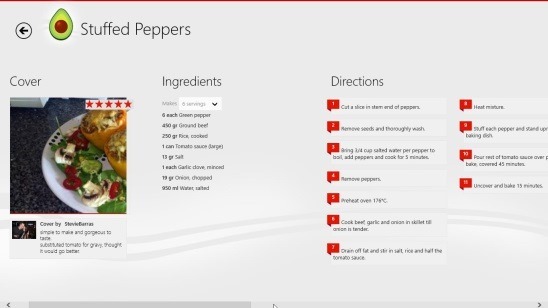 Also check out these 4 free Windows 8 recipe apps. allthecooks app is hands down a good free Windows 8 cookbook app. It can be of great help during family gathering, thanksgiving, homecoming, house parties, etc. The varieties of food and their directions are something praiseworthy, you can easily cook American, French, Mexican, Chinese, Mandarin, Indian, and many more. Plus you can connect to anyone who’s a user of the app and get socialized. All in all, the features are really recommendable, the only thing missing in the app is video tutorials. However, you won’t feel their need since the pictures and steps are sufficient enough to clearly explain the recipe preparations. Use the app to try cooking something new and surprise your kids, friends, or family. You might also like this Windows 8 food app to find gluten-free restaurants.